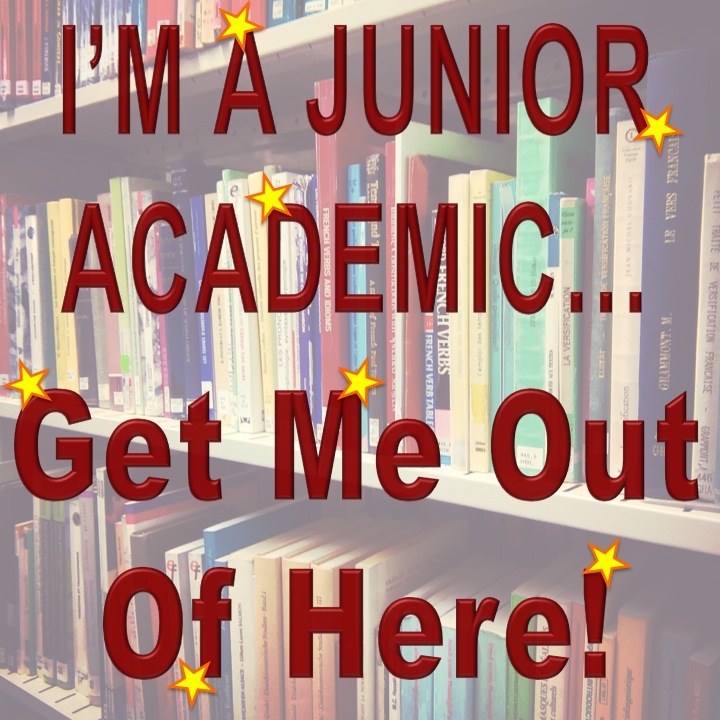 I’m a junior academic…get me out of here! I have had a glimpse of the other side. By which I mean I have seen what lies beyond the perimeter fence of the Ivory Tower Complex. And my, does it look exciting! During my time at POST I liaised with lots of people who had PhDs however had pursued careers outside of academia. 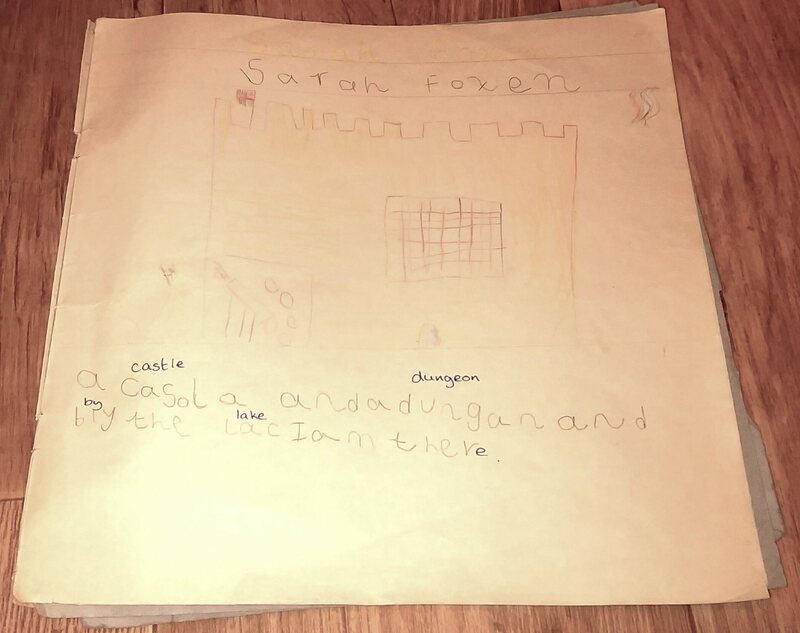 So, in this blog post I’m going to tell you about six jobs I’ve discovered you can go into with a PhD: three in the private and public sector and three specifically in Parliament. I’m also going to make suggestions as to how to explore further. Okay, I confess, this job would see you based in the Ivory Tower. However, if variety is your thing, and you’re keen to engage with the wider world whilst keeping a foot in the academic world, this could well be a path for you. At POST I liaised with forensic linguists and phoneticians who were based in universities, but who were also practising experts. This meant that, as well as the teaching and research, they also did forensic casework. This entailed compiling forensic reports for the Crown Prosecution Service, police forces and solicitors. They also appeared in court as expert witnesses. Think about how and where your expertise could contribute in the wider world. What skills have you been developing that you could apply elsewhere? Are there any academic-practitioners in your department or field? What do they do? If there aren’t, does that mean you’ve discovered a niche?! If you don’t want to stay in academia, but do want to stay in your field, this could be the path for you. During my fellowship I came across practitioners (in this case forensic consultants) who were using the expertise they’d acquired during their studies on a daily basis. As a specialist, it’s obviously important to keep up to date with developments in your chosen field. The consultants I met were members of professional bodies and also attended relevant conferences; however, they didn’t have the research and teaching pressures that come with academia. Look into the professional bodies that exist in your specialist area. Struggling with the bullet point above? Try looking at your research with a wide-angled lens (e.g. what school subject would you class it under?) Now think again about professional bodies or learned societies in your general area. Google them and dig around their websites. Next time you’re led by PhD-boredom to Google academic conferences, focus on those attended not just by academics, but also practitioners (look at previous programmes). Can you attend? If not, use the info there to investigate companies and organisations in your area. It might be that you want to make use of your specialist knowledge or skills, but don’t want to work in the private sector. If this is the case, then maybe the public sector is for you. When researching my POSTnote, I talked with specialists in the Metropolitan Police Service and the College of Policing. Some of these individuals were doing jobs closely linked to their area of expertise (like industry specialists). Others had roles in which their research and communication skills were significant and their academic background less so. If neither the MPS nor the College of Policing are for you, have a gander at this webpage which lists all the government-affiliated agencies and public bodies, for example UK Sport, the Environment Agency, and the Met Office. By my calculations, there are 361 to look through! If you’re anything like I was about a year ago, you’ll know the words ‘government’, ‘parliament’, ‘cabinet’, ‘department’, ‘civil service’ and ‘committee’ but don’t really know how they all fit together. If that’s you then look at Newton’s Apple An Introduction to Science Policy. For scientists and non-scientists, it gives a comprehensible and concise explanation of the structure of government and parliament. So useful! Judging by the age of the committee specialists I met, this is a job you can do from relatively early on in your career! It entails supporting a Commons’ or Lords’ select committee. If you don’t want to pursue a career in your field, but like research and report writing, this could be your dream job! If you don’t know, select committees have the remit of scrutinising government departments so, for example, the Defence Committee scrutinises the Ministry of Defence. Committees, which are formed of backbenchers, carry out inquiries relevant to their area. Committee specialists support the committee in gathering and collating written and oral evidence and assisting in writing the reports. Crucially, committee specialists are not necessarily specialists in the areas covered by the committee. For example, I met one specialist who had worked for three completely different committees. What you’ll require, then, are brilliant report writing skills and an ability to get to grips with new areas and disciplines fairly quickly. Have a browse around the different select committees that exist. Have a look at some of the reports produced by committees; they’ll give you an idea of the kinds of research you’d be doing, people you’d be interacting with and reports you’d be pulling together. This is a job for those of you who are good at keeping secrets! Also for people who might want to stay in their general area of interest, and who enjoy doing shorter pieces of research with quick deadlines. Library specialists might have expertise in their area; however, this is not always the case. They work in one general area, for example ‘environment’, and compile briefings for MPs and Peers on relevant topics. If a debate is planned to take place in parliament, a specialist might also compile a debate pack including relevant policy documents, recent press articles etc. to help brief the MPs and Peers. As for the secret keeping, well, that’s because library specialists provide an ‘answers service’ for MPs’ and Peers’ questions. And that answering service is confidential! Why confidential, you may ask? Well, because they might not want others to know their game plan, nor the gaps in their knowledge! Read more about the commons library and its research service here. Have a think about what it is you enjoy about research. Is it: a) increasing your own knowledge in a niche area; b) setting your own research agenda; c) carrying out a long piece of research; d) researching new areas; or e) finding an answer to a question, then moving on? This might help you establish if this is the job for you. Maybe you didn’t know how to answer above? Why not try this challenge: find a topic of policy relevance in the headlines and, in the space of a couple of hours, see how much information you can pull together on that topic. How did you find the challenge? Or what about this challenge: get a friend to ask you a question – any question. Then, go away and have a go at answering it. Do NOT rely on Wikipedia alone! How did you get on? Do you like finding out about new subjects within your broad area (say, for example, ‘energy’ or ‘ICT’)? What about talking to people from different backgrounds: industry, government, academia, for example? If you answered yes to both, then maybe this is for you. As you know by now, I did my fellowship in the Parliamentary Office of Science and Technology. As well as the fellows, the office has permanent staff – scientific advisers, who cover different areas: health, biological sciences, physical sciences, ICT, energy, environment and the social sciences. Advisers produce briefings on topics in these areas and supervise fellows as they research their briefings. They liaise with parliamentarians, organisations and industry, and put on events for MPs and peers, raising awareness around topics of policy relevance. See if you are eligible to do a POST fellowship: if you’re Research Council-funded, you’ve got until the 28th August to apply here. Have a look at the POST website and the POST briefings. The remit of a POST briefing is that it is for an intelligent, non-specialist audience. When was the last time you wrote for a non-specialist audience? Challenge yourself to try writing a couple of hundred words about something from your area of research that would make sense to a non-specialist. How did you get on? Et voilà! You have options! 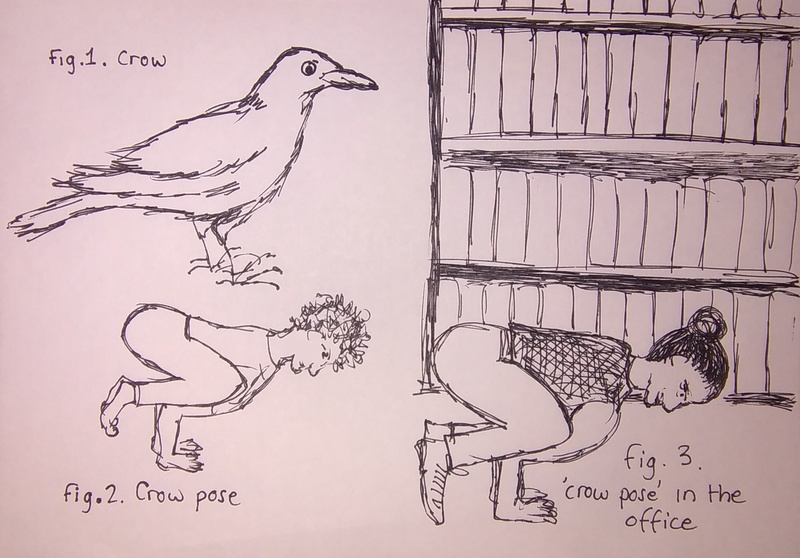 In my next blog post, I’m going to talk about some of the secret skills of a PhD student. I know some of you are concerned that apart from your studies, you’ve not got much on your CVs. So I’m going to cheer you up by flagging up some of the awesome desirable skills you might not have realised you’ve got! What can you learn in three months? How often do you reflect on what you’ve learnt in a given period of time? My fellowship at the Parliamentary Office of Science and Technology ended last week. In the final days I reflected on what I’d learnt during the experience. One of the outcomes of this reflection is a work called ‘Educational Elements of a POST Fellowship’ which you should be able to see in the link below. 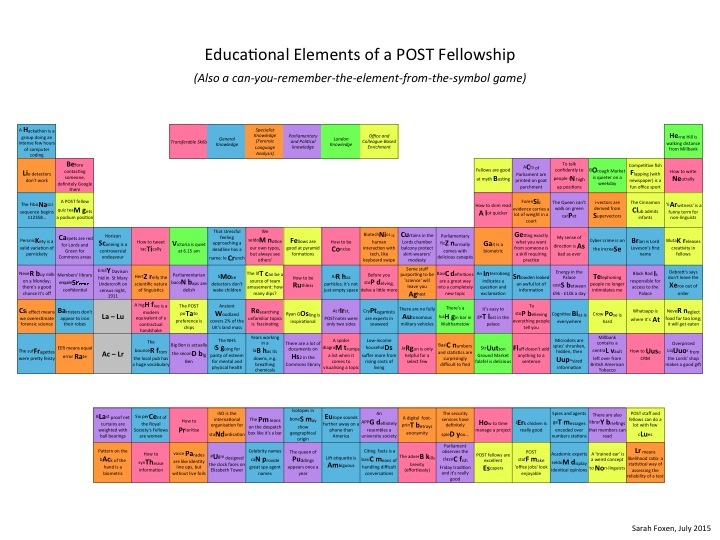 In the form of a periodic table, and built around the symbols of the elements, this piece illustrates some of the different skills, facts, and pearls of wisdom I learnt during my time at POST. If you want to learn about parliament or politics, look at the purple boxes. The blue boxes will give you some general and some niche facts. Some of the things I learnt whilst researching my briefing on forensic language analysis are to be found in the orange boxes. There are a couple of nuggets about London in green; however, unless you’re planning to visit Walthamstow or are likely to make the journey from Herne Hill to Victoria, I’d say you won’t get much out of these. As for the pink boxes, these are skills that I acquired, so reading these you will either be envious, or, more likely, simply raise your eyebrows in shock that it is only now that I am developing some of these skills. Finally, if I’m perfectly honest, the yellow boxes are basically in-jokes for my colleagues; however, if you’re after mild amusement or intrigue, then read these. Now, as useful as they are to me, these 118 educational elements are of limited use to you.